On a daily basis Rebecca keeps tabs on the comings and goings of hundreds of the most beautiful and historically important art objects in the entire world. Each priceless item must be carefully tracked as it is loaned out to another museum, or becomes part of a traveling show, or is simply grouped for display within its home museum. We wanted to learn some of her secrets for keeping track of such important art objects. So we took a tour of her office and then walked out into the exhibition spaces to look at some of her recently installed exhibitions. 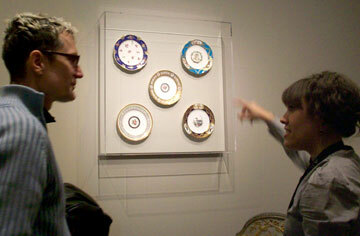 We saw incredible Biedermeier furniture, gorgeous objects of every description, silver, porcelain, glass, and gold. Objects that clearly belonged to royalty. Then she showed us one showstopper. A plate actually owned by Marie Antoinette, that caused me to think back to those wild days of the French Revolution, when Marie Antoinette and her doomed King briefly escaped Paris in a horse driven carriage. We all know what happened next, but just to be standing next to one of the plates these people ate dinner off, is really a trip. This little dinner plate was at The Revolution. And this one plate is just inventory “item number such-and-such” in a huge database of thousands of other noteworthy items, that the museum has to keep a close eye on. Since we manage an inventory of contemporary paintings, the systems for handling these inventories have a lot in common and colleagues can learn a lot by sharing ideas in place in galleries, museums, and private collections. So Thank You Rebecca for showing us around, we promise to come back and take you out for lunch as soon as the weather gets nice!